Back River empties near the mouth of the Chesapeake Bay in Hampton, Virginia. It’s not long—only about two miles—but it splits into a north and south branch, both of which wrap around much of the Air Force’s Joint Base Langley-Eustis. With so much coastline, Langley is particularly vulnerable to the effects of climate change, including sea level rise and stronger storms. And while the seas are rising, the land on which Langley sits is also sinking, or subsiding. Sinking land and rising seas make Langley much more vulnerable to flooding, so the Air Force is trying to protect its base by investing in its shorelines. 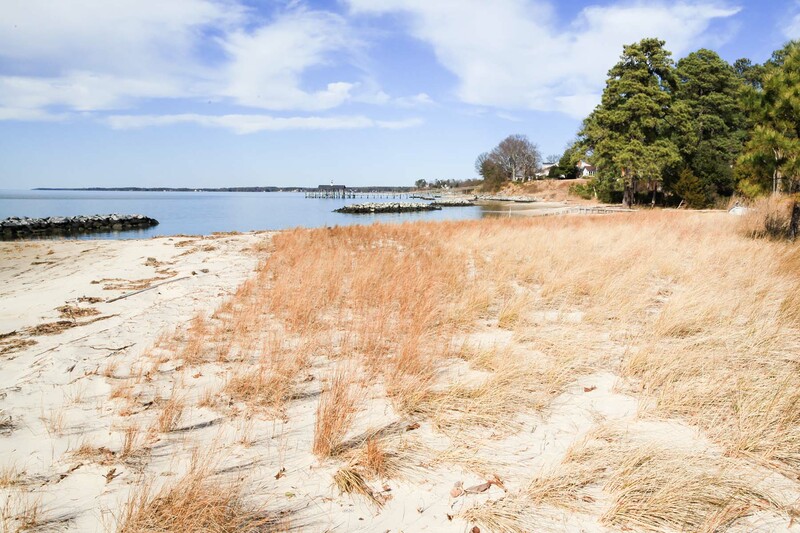 So far, they have completed over 3,000 feet of shoreline restoration. Not only will the restored shorelines increase the installation’s resilience to major storm events, they will also provide habitat for animals. Garcia points to areas of restored shoreline she describes as ideal for diamondback terrapins, and she identifies other species of plants and snails that signal a successful restoration effort. 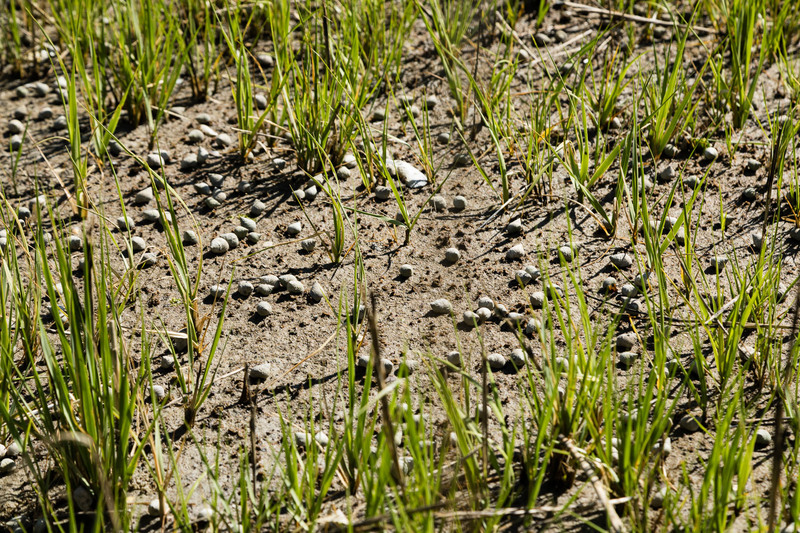 Periwinkle snails dot the ground at one of Air Force Joint Base Langley-Eustis’ restored shorelines. These snails are a good sign because their presence means the planted vegetation is well-established; the snails need to be able climb up the plants when the tide is high, which happens once the area is reestablished. Nearby, the Navy is also working on shoreline restoration. Just up the highway is the Cheatham Annex section of Naval Weapons Station Yorktown. This facility also shares quite a bit of its boundary with a waterway, the York River. Cheatham Annex plays an important role for the Navy in terms of cargo handling and logistical support, and its pier that stretches into the York is key to fulfilling that mission. However, eroding shorelines along either side of the pier posed a threat to the installation’s main supply hub, according to Thomas Olexa, the installation’s natural resources manager. On top of that, concerns about potential contamination from netting that had been repurposed as shoreline stabilization caused the Navy to take action. 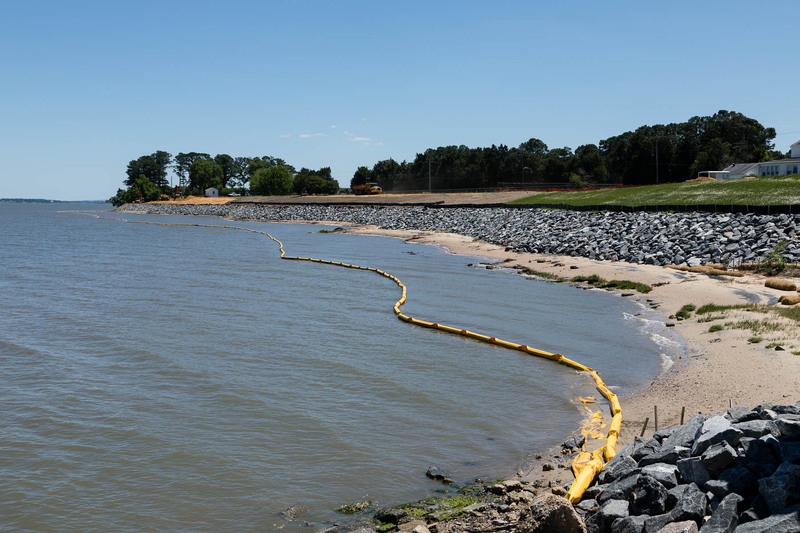 The newly regraded shoreline at Naval Weapons Station Yorktown, Cheatham Annex waits to be planted with wetland plugs to help absorb energy from waves and wind. Now, they’re working to stabilize and restore that shoreline. The netting was removed and the shorelines regraded to create a gentler slope. They installed riprap—a layer of rock to help stabilize the shore—and will be planting wetland plugs in front of it to help absorb incoming wave and wind energy. They’ve also added a pollinator meadow on the land uphill from the shoreline. The work they’re doing around the pier is similar to work already completed further north in Cheatham Annex. A road running along the shore was badly compromised due to the deteriorated riverbank. Much of the bank was washed out during Hurricane Isabel in 2003, turning the coast into “basically a cliff face,” says Olexa. Completed in 2014, the shoreline restoration project stabilized the riverbank, and new wetland vegetation helps absorb wind and wave energy. Restoration work is not antithetical to military operations, say Garcia and Olexa. 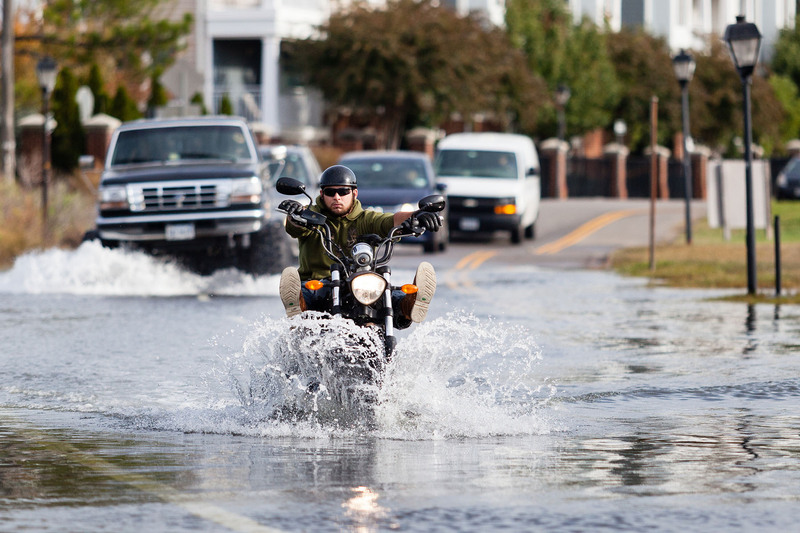 The Air Force wants to prevent flooding of its buildings and runways, and the Navy wants to protect what they call key assets to supporting their mission. But projects that support the military can also support wildlife habitat and water quality. 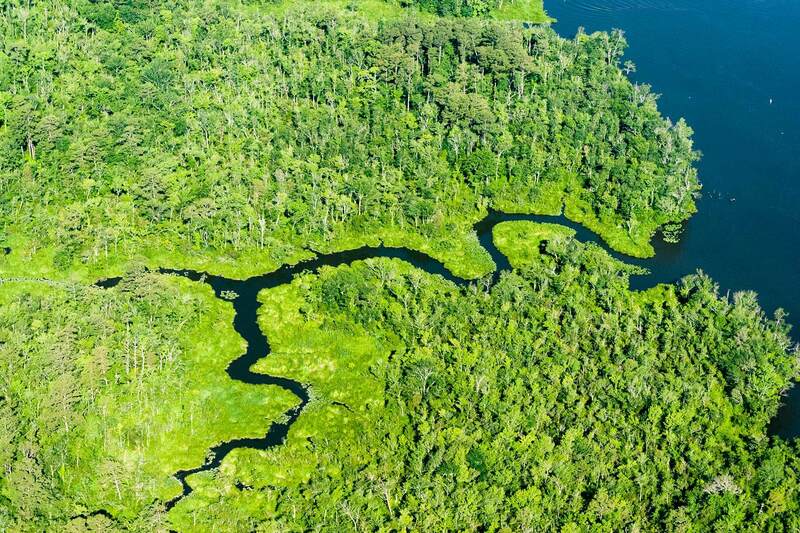 About Joan Smedinghoff - Joan is the Web Content Specialist at the Chesapeake Bay Program. Originally from Chicago, she was introduced to the Chesapeake Bay region through the streams of central Pennsylvania. She received her Bachelor's in Environmental Studies from Dickinson College in Carlisle, Pa., where she first discovered her passion for storytelling.